Read WANN: Anwar's story, a 31 y/o who has been employed by UNRWA for over six years. A job that pays enough to survive and support one’s family is valued above all things in Gaza, and no wonder. The overall unemployment rate currently hovers at 49% and reaches nearly 65% amongst teenagers and young adults (15-29 y/o). It is also important to mention that, 85% of all unemployed individuals are women. That means, 2 million people in Gaza- 53% of their population -live in poverty. The best of the jobs in Gaza- with fair, relatively stable salaries -are with international NGOs, including the UN refugee agency, UNRWA, which alone employs nearly 13,000 residents. However, the decision made by the U.S. administration of Donald Trump to cut funding for UNRWA from $365 million to $65 million has jeopardized even these “safe” jobs. This month, UNRWA announced that they are immediately laying off 113 of their employees and transitioning close to 600 full-time workers to part-time employment. The employees' union estimates about 1,000 jobs will eventually be slashed. Among them is, Anwar Hamad, a 31-year-old social worker and mother who has been employed by UNRWA for about six and a half years. Anwar’s job is to identify and categorize families in need of UN aid such as food. She questions, "Who will do this once we lose our jobs? Who will make sure these families are served?" Anwar, the mother of four children, has been informed that her contract will be terminated by the end of the year and that in the meantime, her pay will be cut- from $900 to $450 monthly -in. Not to mention that, $400 of that $450 will go to the bank in order to repay a loan she took out two months ago to build her own house. "I feel insecure and lost,” she says. “I gave up another job offer so I could get this job. I thought I would feel safe in this one." Anwar’s husband is an employee of the Palestinian Authority (PA), which means he only receives half of his salary due to cutbacks imposed as part of the PA’s campaign to force the government in Gaza, Hamas, to surrender their authority. "We can no longer afford the rent on our house; how can we pay our expenses without my job?” Anwar asks. “We have to move out by the end of this month. I will go to my mother’s, along with our kids. But my husband will have to live with his family. My family will be separated." To make things even worst, Anwar’s job with UNRWA has allowed her to be the backbone of her entire family. However, now that she has been laid off, her family will no longer be able to afford school expenses for their children; and, she will struggle to continue financially helping her mother, nine sisters, and two younger brothers who are unemployed. "When I got the email saying that I would no longer have a permanent contract, it was the worst moment in my whole life,” she says. “I went home and couldn’t eat or drink. The email felt like my execution." 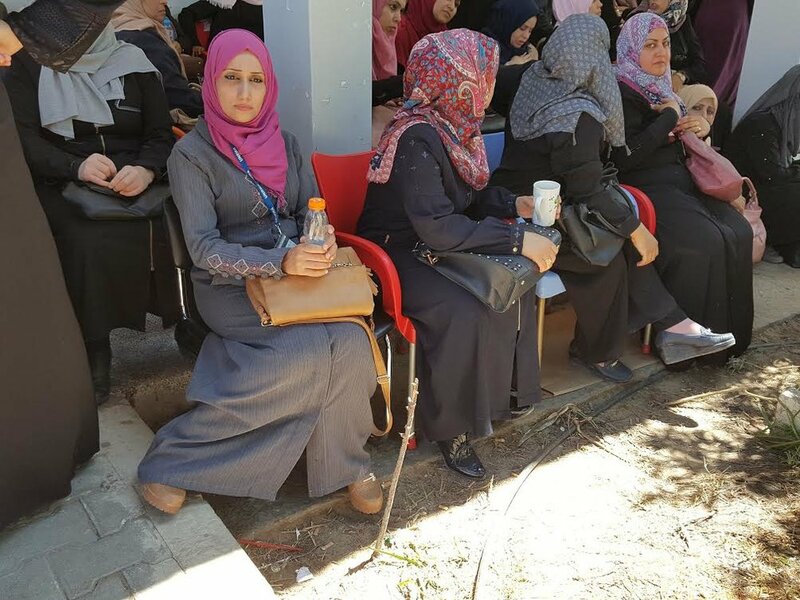 UNRWA employees fear that more layoffs are coming and are overwhelmed by the large amount of work they have been faced with as a result of the layoffs that have already taken place. That’s why they are protesting. Although the layoffs were triggered by U.S. funding cuts, Anwar and her coworkers also blame UNRWA management. They insist that the agency’s efforts to raise money from other sources had been going well and that there are ways to save resources other than firing staff. In particular, they question why the first employees to be laid off were those assigned to emergency programs, such as social workers, security guards, and school counselors. Newer PostRead WANN: "Disability No Barrier for True Athletes in Gaza"
Older PostRead WANN: "Solar Light Fills A Dark House With Light"